This vanity has both an all-around look and a classic style. Its white marble counter and brown solid wood base will look beautiful in your home. Put a classic feel in your bathroom with this good-looking set from Wyndham Collection. The 48 Lotus Single Sink Vanity is a stylishly prominent piece for any bathroom in your home. Straightforward cabinetry lines are enhanced with an unusual curved front and contemporary metal hardware. The trendy dark brown finish and Travertine Marble top lend sleek sophistication to this piece, while six drawers hide bathroom necessities. Hang the coordinating mirror above for a stunning ensemble.Faucet not included. 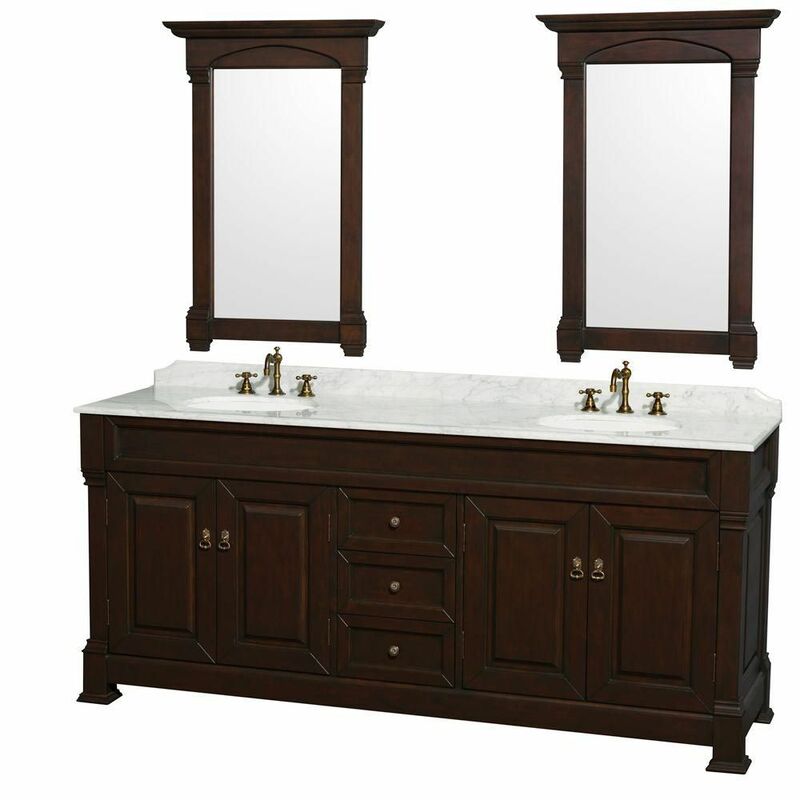 Andover 80-inch W 3-Drawer 4-Door Vanity in Brown With Marble Top in White, 2 Basins With Mirror This vanity has both an all-around look and a classic style. Its white marble counter and brown solid wood base will look beautiful in your home. Put a classic feel in your bathroom with this good-looking set from Wyndham Collection. Andover 80-inch W 3-Drawer 4-Door Vanity in Brown With Marble Top in White, 2 Basins With Mirror is rated 5.0 out of 5 by 3. Rated 5 out of 5 by Tabbers from Beautiful piece. Arrived early and was packaged well. ... Beautiful piece. Arrived early and was packaged well. Rated 5 out of 5 by Patty from The Vanity arrived very well packed and just as the... The Vanity arrived very well packed and just as the description indicated. Rated 5 out of 5 by ShiplapForDays from I'm very pleased with this vanity. On the first day of the time window that was listed after my p... I'm very pleased with this vanity. On the first day of the time window that was listed after my purchase, a third party company called to set up delivery. The vanity was delivered on a pallet and very safely packaged. The particular company who delivered mine (I imagine it's contracted by area), was only contracted to deliver it to the street, but I managed to talk him into leaving it in the actual driveway. The vanity top was not attached to the vanity (thank goodness), but the top and backsplash pieces are attached. Though the item is described as dark cherry, there is not much red tone to it at all, which was a plus for me. The color is more of a neutral dark walnut. Very pretty. I chose not to use the included mirrors, and in fact have yet to open them. The only negative I have found is that the drawers take some effort to close. They do not have a soft-close feature, where the drawers catch and close themselves. We installed this vanity in a 2nd story master bathroom, so the base and top had to go up some stairs which have a turn in them. It took five men to get the top upstairs. I know you're anxious to order such an item sight unseen, but I am so truly relieved and pleased with my purchase. If I'm able to edit my review later, I'll add additional photos. are the countertop and sinks packaged separately or is everything assembled?